For the English-speaking equivalent, build a large concrete box in the middle of a car park. If you are feeling adventurous, you might paint it beige. On the glass doors, put a big sign saying "no dogs, no bikes, no scooters, no skateboards". When you arrive in your car and your children begin to walk towards the box by themselves, don't forget to shout at and scold them for not standing back for the cars. If you see school children in the shopping centre by themselves, view them suspiciously and assume they are thieves. Isn't it ludicrous that people can hold two simultaneously contradictory beliefs: that we can provide seemingly never ending amounts of land to be gobbled-up by motor-vehicles, but we aren't able to provide very modest amounts of space for bicycles. The irony is of course, that if we had more people riding bicycles, then fewer people would be driving. Plus they'd be happier, healthier, less fat, safer and a little richer. Furthermore, children would be safer and free to explore too. New developments are nothing like that where I am in Canada. Here they consist of these 1500+ sqft. houses (half of which is a garage). In order to shop you have to commute great distances on high-speed roads, which automatically makes cycling (or walking) less attractive. The other type of developments are the big box stores out in the middle of no-where, again on high(er) speed roads. Most of the space in these developments are taken up for car parking, while only having two or three bike racks (at the most). Had you not said that was a new-development in that video, I would never have guessed. Ryan: The houses in this new estate are not particularly small. I think North Americans often imagine that Dutch people live in very small homes, but actually they don't. British houses are on average somewhat smaller. 1500 square feet is about 140 square metres. The way it's counted here they don't include the garage, or indeed the hallway or other non "living" parts of the houses. Here are some houses for sale in that area. Most have a living area greater than 140 square metres (the first number), all will have somewhere to park a car, most also have a garage and all have storage suitable for a bicycle (berging) - it's a legal requirement. Skimming through some of those homes, the biggest difference was garage size. The size of those garages weren't overbearing or the focus point of the house. New homes in Canada tend to have the garage as the main feature. I picked "9408 EN Assen" and looked it up on StreetView, and was caught off guard at just how "suburban" it really was. I didn't notice any retail store in the immediate vicinity. Of course the biggest difference was how the roads appeared to have low speed limits and dedicated cycle paths. Many of our new developments lack sidewalks, cycle lanes and slower speed limits, which is a shame because one day in the future they will have to be added. I found it interesting looking on StreetView at (Aletta Jacobsweg & Rosa Spierweg), the roundabout where it appeared a group of school age students were out for a class trip or training. Ryan: That would be rather similar to someone from here thinking that everyone in Toronto lived in a small apartment like this one ! I live very much in the suburbs myself, though a slightly older suburb from the 1970s. People who've not been here often imagine it's very different from the reality. Actually, distances that Dutch people travel regularly are not really very different from the distances that people in other places travel regularly. I'd not noticed that school group caught on Streetview before. For others who'd like to see it, it's here. Click forwards along the road to see more of them. The reason you can't find those shops is that they had not been built when the streetview car went there. What you write sounds nice and good, but in this relatively small pedestrian area I see bike parking in the middle and vehicles which while slow would prevent even slower children's games. There is no greenery, no furniture, no sculptures. It's a calm but cold space. Shifting back to the old, what would a square like this look like in the Netherlands and adapted for cycling? 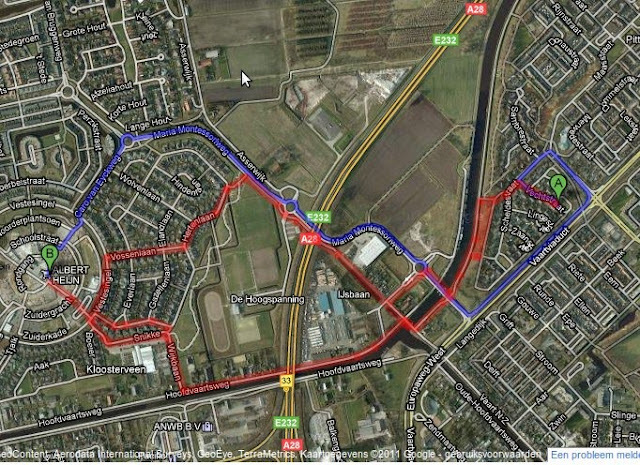 Your photo of current Assen in the older entry shows a linear corridor. But again back to this development on the outskirts: The car parking is free, so the bikes have to be close in order to provide better access than cars... how much excess capacity is there (beyond what is needed by residents)? Do these vehicles create emissions going in and out? Sure. Danger? Do you know how expensive underground parking is and how embedded energy is in concrete? I don't really buy this design (making comparisons to the UK is easy, innit?). Some towns (Delft, Goes, Helmond) have started reclassifying city centre pedestrian high streets as accessible to cyclists using the exact same method (classing it as a 'pedestrian zone - cycling allowed' rather than 'cycle path'). I've seen it in a few German cities as well. GIF: Give it a chance to be finished and to become greener. I made that video in November, nearly a month before the official opening in December. It's still not actually completely finished. I think you're missing the point about the car parking being free of charge. What you have here is an example not of a hair-shirt community choosing to exclude cars and embrace bicycles, but of "everytown" being designed to encourage cycle usage. Given the problems which occur so frequently in other places when attempts made to restrict motor vehicles are interpreted as a threat to people's freedom and livelihood, I think there is a lesson here about a better way to go about things - a way which involves less conflict, but works. My comparisons are mostly between the Netherlands and the UK simply because I have lived in both countries. The rather idealized, touristy, photo of Siena which you point to looks nice enough, but it is also very close to being a space with "no greenery, no furniture, no sculptures". There are also very nearly no people in it. It's not remotely the same thing. I'm not going to attempt to make any further comparison. I have not been there, and I have no idea how the space is used as a part of everyday life. This is not something which can be compared purely on the basis of figures or that photograph. Small, intimate spaces are nice but at northern latitudes (Berlin is comparable to Amsterdam) get dark a good part of the year unless the surrounding buildings are really short. But I suppose my main point was how it would look with lots of bicycles parked everywhere, even neatly. This is a huge and famous square and I am curious if something this like in the NL would exclude bikes for parking or might put them underground (if just 60 or 90 seconds distant). I am all for appropriate automobile use, but all this expensive, energy-intensive construction to avoid conflicts does not avoid conflicts (trying to make clever joke about wars and energy resources) and just today two of our mutual friends in the NL were talking about how the Dutch are avoiding conflicts (video of thief or fake thief near Amsterdam Centraal Station -- people do nothing, perhaps more and more these days. The Germans - speaking very generally - have a very impossible "have your cake and it eat, too" mentality about mobility solutions: They want it all, but there is not space (nor money) for all of it. The Dutch are not totally dissimilar: I know about wishes for lots of underground car parking in Amsterdam which would I am sure cost a fortune and reek havoc on old foundations (though perhaps not as bad as the metro construction). Todd: As you know, impressions gained from afar can be quite different from reality. Photos can be taken in a way to show any place as wonderful. This is one of the reasons why we encourage people to come here for a Study Tour so that they experience what it's actually like, as it's easy to create a positive impression by visiting with a pile of photos and easy to form a wrong impression from a distance. I find your comments rather strange. First you complain about a lack of "green" and a lack of furniture, and now you say that smiles are equivalent to "green" and that people can sit on the ground. Either trees and seats are important, or they're not. People smile here too, you know, and can also sit on the ground. However, actually we have both trees and seats, and quite a lot of both. As it happens, Assen is full of trees. Making room for them is part of why the population density is so low (780 people per square km in Assen vs. 3800 in Berlin). There are two forests within the city, as well as many other smaller green areas, and many rather lovely areas close by outside the city, including the Arboretum which we walked the dog to on Sunday. It's the "greenest" place I've ever lived. From where I'm sitting now I can see out of windows at the front and back of the house, and there are trees in both directions. As well as the green (environmental) policies which I wrote about before, there are also "Green Structure Vision" policy documents about this sort of thing. If trees have to be cut down in one place, they are replaced - and then some. The video you post a link to is rather a ridiculous example: There's someone doing something outrageous on the street, someone screaming at him. Also, behind the camera we've a small group of people aiming a video camera at them and recording the sound. Possibly also a director telling everyone what to do. Of course the crowd didn't intervene - it's very obviously a TV production in the making ! That people will walk by those in need is an unfortunate part of life in large cities anywhere in the world. London, New York, Berlin, Amsterdam, anywhere. In this case, though, it's indicative of something more than that. The crime rate here in the Netherlands is actually really low. Prisons here don't have enough prisoners in them, and are threatened with closure. An innovative solution to this is to rent prison space to the Belgians. This all makes for a hard life for journalists. A couple of weeks ago our local paper had to run with a front page headline which read "Positive year for local libraries", and that's not the sort of headline which pulls in readers. The TV company who's website you provide a link to are being more creative than most. They're trying to make news because they haven't really got much to report. This doesn't, of course, stop some percentage of local residents from being entirely convinced that the country's going to the dogs - but that's normal for all populations everywhere. Todd: What David has shown here is the central part, the hub, of a new suburb. This regrettably had to be situated on the other side of a motorway but Assen has no room left to build. The suburb, Kloosterveen, consists of houses with gardens and playgrounds, with all commercial and communal activity concentrated in the centre, Kloosterveste, which is intentionally shaped like a medieval town, complete with a moat (veste = Festung). Narrow streets for pedestrians, no room for cars. Commercial interests dictate that customers can go there by car, so parking was provided underground (a stupid idea as -veen means moorland). The hub will never be very green, but the places where people live around it already are. There are a golf course, arboretum, a recreational area with lakes and campings, and all around farmland at a short distance. As for the van in the picture, this belongs to a utility company un-blocking sewers. I suppose they had a job to do for which they had to go close to the problem site. Kloosterveen and Kloosterveste are on the left. Assen is not a bad place to live. Very quiet compared to Berlin, of course. But if you speak Berliner Platt we even understand you. For what it's worth, I spent a week in Siena in the summer of 2009, find pictures here (just impressions of my gf and me, not an urban development photo excercise ;)). My take away: beautifully preserved town, centered around the famous square (yes, we laid down on it), with a ped/bike only main (circular) & side streets, mostly car-free. You're also a very short walk away from the (busy) arterial roads (which are mostly one-way), that gradually grow in size and volume moving away from the city. Italians will be Italians. RE: the greeness; the historic grid doesn't include much of that, not in a consistent way. But you don't really miss it, as the town's grid/feel/look is so unique, its charm captures you in a way that you won't think it's any less livable. It is certainly green on the outskirts (again, a very short walk), aka where the city park & vineyards start. I can see how it all works. And I don't think they messed with the original setup. Meaning: my guess is that there never was any green in the downtown area to speak of. If you don't count flower baskets in the windows and on front door stoops. One of the reasons this setup works is that there are no cyclists asserting their "rights" to ride through at speed. I suspect there are fewer such cyclists in the Netherlands since there are fewer car drivers asserting their "rights" to drive anywhere and everywhere at speed. When "rights" take precedence over commonsense, the result is what you see in the UK: the mightiest's (ie car's) "rights" prevail. I have noticed previous blog entries concerning the few Dutch examples of obstacles to cyclists or shared space which doesn't work so well. You can imagine how surprised I was to stumble upon this: this, a rather British looking effort in Maastricht. I know Limburg seems to lag behind a bit generally when it comes to cyclists though. Matt: Yes, very "British". I really must make my way down to Limburg one day to have a look around. It seems like it's a different world down there. And yes, the cycling rate is low for the Netherlands, though the capital of the province is at least trying to do something about it. I'm coming late to this posting, I know, however, amidst the euphoria about this kind of infrastructure, I would like to point something out. Infrastructure like this (pedestrianized "bike allowed" areas, street sharing schemes) leave out one class of street users consistently: blind pedestrians such as myself. While streets might be getting safer for cyclists and ordinary pedestrians, their "no priority" design means blind users are faced with increasingly unnavigable streets. Next time, pay attention to guiding lines: installed with no apparent system, haphazardly, guiding past non existing dangers, sometimes leading directly to danger. I've seen this situation get worse over the years with the adoption of modern "street sharing" ideology as a design principle in modern areas such as these. I really wish I could go on a study tour. I do not however have 600 euros and travel expenses nor do I have a lack of aerophobia, and boats don*t travel from North America to Europe without being expensive cruise ships. Also, about much endurance at what speed do you recommend for being on one of your cycling tours? Lodro: Please do not confuse what you see here with the confusing shared space design which does indeed cause huge problems for blind people. Sensibly designed places in the Netherlands have plenty of guidance for blind people. Restlesstablet: Endurance and speed ? Not much. Our study tours move at a relaxed pace and we stop very often to look at the infrastructure and consider how people use it.